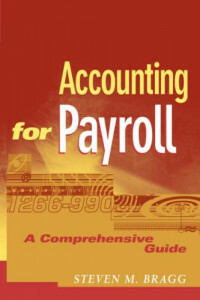 The most comprehensive resource available on the subject, Accounting for Payroll: A Comprehensive Guide provides up-to-date information to enable users to handle payroll accounting in the most cost-effective manner. From creating a system from scratch to setting up a payroll department to record-keeping and journal entries, Accounting for Payroll provides the most authoritative information on the entire payroll process. Ideal for anyone new to the payroll system or as a skill-honing tool for those already immersed in the field, this hands-on reference provides step-by-step instructions for setting up a well-organized payroll system or improving an existing one.